Scar tissue develops after skin heals from wounds and might be unsightly in certain instances. There are myriad creams and ointments available for treating scars and helping them shrink in size or disappear. Some of these ointments are more effective than others. Homeopathic creams and scar treatments are also available; and although there is no scientific research regarding the efficacy of these treatments, anecdotal evidence indicates the remedies may reduce the appearance of scars. Homeopathic medicine helps the body heal itself by initiating the person's natural response to a stimulus. A homeopath should be consulted before using homeopathic remedies for this purpose. Apply thiosinaminum ointment to your scar in a thin layer. Thiosinaminum is a homeopathic remedy mixed in a lanolin ointment whose specific indication is for dissolving scar tissue, according to homeopath Dr. William Boericke in “Materia Medica and Repertory." It can be used for all scars, including acne scars and stretch marks, and might reduce and lighten the scarring, according to the University of Hawaii. 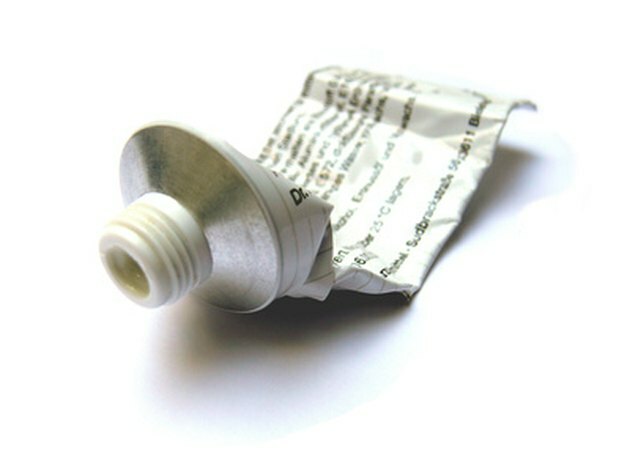 Use thiosinaminum mixed in a glycerin solution on scars that are visible, for example, on the face. "It is less greasy and is more easily absorbed into the skin," says Manfred Mueller, president of the North American Society of Homeopaths. Mueller goes on to say "thiosinaminum is an excellent substance that dissolves scar tissue over time when used repeatedly and with diligence." "Take thiosinaminum orally in homeopathic dilution to dissolve large, extensive scars or keloids," Mueller says. The oral dose supports the action of the topical application. Do not take this remedy orally without first consulting a homeopathic practitioner. Use homeopathic silica to reduce scar tissue. Silica is well known for its ability to lighten and dissolve scars and keloids of all kinds, according to homeopath Frans Vermeulen in the "Synoptic Materia Medica." The University of Michigan Health System mentions that silica, also called silicea, may be helpful in reducing acne scars. Place 20 drops liquid silica in a 3X potency into a 1 oz. bottle of glycerin and water solution and apply externally to scars. The silica and the glycerin solution can be obtained at homeopathic pharmacies online. Take silica orally in homeopathic dilution to treat scar tissue, recommends homeopath Dr. Margaret Tyler in "Homeopathic Drug Pictures." If you need to take silica orally, consult a homeopathic practitioner before doing so for the correct dose and potency. Thiosinaminum can be reapplied as needed, up to three times a day. The ointment may be greasy and is best applied at night if the scar is visible. Thiosinaminum ointment, cream and glycerin solution is available from certain online homeopathic pharmacies that compound their own remedies. Always consult with a knowledgeable homeopathic practitioner before using homeopathic remedies for scar removal. If your symptoms worsen, stop the treatment and call your homeopath.